Operating from within the iSimangaliso Wetland Park, Jacana Properties, are experts in property investment in St Lucia, KwaZulu Natal - and with the launch of their new Flex website they are ensuring more potential buyers are able to see their property listings in this unique coastal area. With a property portfolio that includes houses, flats, townhouses, businesses, commercial properties and holiday rentals the Entegral Folio theme provided the perfect platform to showcase their various property options. 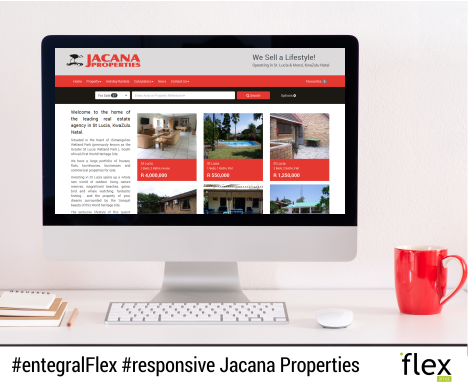 The www.jacanaproperties.com website allows for fast property searches from a laptop, tablet or smartphone without compromising on the easy to use responsive user interface. Potential buyers will also be able to calculate bond repayments or read the news without having to switch devices. If you are interested in finding out how you can have your own cost effective responsive real estate website, that not only reflects your brand but offers cutting edge technology visit www.entegral.net today!